Semtech Corporation (Nasdaq: SMTC), a leading supplier of analog and mixed-signal semiconductors, today announced it will be participating in the 4th LoRa™ Alliance All Members meeting in Santa Clara April 4-6. 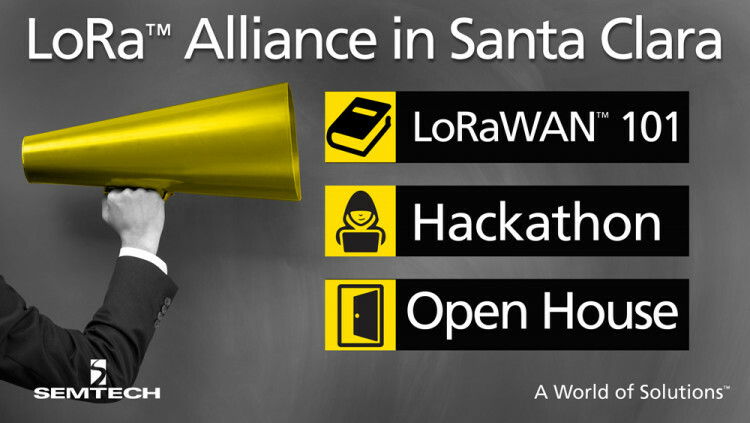 The Alliance events will include several activities for non-members, including an open house where participants are expected to get a thorough overview of LoRaWAN™-based low-power wide-area networks (LPWANs), live Internet of Things (IoT) product demonstrations from members of the LoRa Alliance ecosystem (LoRaWAN Open Marketplace), a LoRaWAN 101 hands-on training from Microchip, and the opportunity to compete for prizes in a hackathon-style competition sponsored by ARM, MultiTech and the Things Network. The open event is sponsored by Cisco and takes place on April 6 at the Hyatt Regency in Santa Clara, California. The hackathon event on April 5 is free for participants who sign up for the open house. LoRaWAN 101, sponsored by Microchip, will cover how LoRaWAN has become a ubiquitous standard for secure, carrier grade LPWANs and how it is helping connect the IoT. Attendees will also get to participate in a hands-on workshop to apply what they learn using LoRa-based platforms from Microchip. LoRaWAN Open Marketplace is where members from the LoRa Alliance ecosystem will provide live demonstrations of their IoT/M2M solutions, which range from modems, modules and sensors, to base stations, network servers and application servers. LoRa Hackathon (April 5) hosted by ARM, MultiTech, The Things Network and Semtech, will provide all the tools and training users need to create a long range IoT application. Participants will have a chance to win mDot modules, Conduit gateways, development boards and much more. The LoRa Alliance is a group of 270+ companies that are dedicated to standardizing the LPWANs being deployed around the world to enable IoT, M2M, smart city and industrial applications. The LoRa Alliance is one of the fastest growing ecosystems for enabling LoRaWAN-based networks and IoT applications with an open and standardized model, making LoRa the IoT technology of choice for large technology leaders such as Cisco, Orange and ARM, as well as start-ups focusing on new business models and solutions for IoT. The cost is $99 to register for the Open House on April 6. The hackathon on the day before is free to open house registrants. For more information on the open house and hackathon, please visit open house registration page. All statements contained herein that are not statements of historical fact, including statements that use the words “will,” “expected to,” “should,” and “enable” or other similar words or expressions, that describe Semtech Corporation’s or its management’s future plans, objectives or goals are “forward-looking statements” and are made pursuant to the Safe-Harbor provisions of the Private Securities Litigation Reform Act of 1995, as amended. Such forward-looking statements involve known and unknown risks, uncertainties and other factors that could cause the actual results of Semtech Corporation to be materially different from the historical results and/or from any future results or outcomes expressed or implied by such forward-looking statements. Such factors are further addressed in Semtech Corporation’s annual and quarterly reports, and in other documents or reports, filed with the Securities and Exchange Commission (www.sec.gov) including, without limitation, information under the captions “Management's Discussion and Analysis of Financial Condition and Results of Operations” and “Risk Factors”. Semtech Corporation assumes no obligation to update any forward-looking statements in order to reflect events or circumstances that may arise after the date of this release, except as required by law.